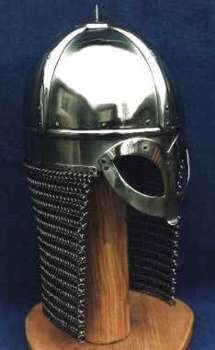 A replica of the Gjermundbu helmet from Norway. Note the inlayed eyebrows in this particular example. Head armour of the period consisted of helmets sometimes including a mail coif. Helmets were made in a variety of ways and from several materials, with the single objective of deflecting or completely withstanding a blow from a sword. Only a few examples of helmets have been found intact. The group of Valsgarde and Vendel period helms are the largest group of helmets to survive the last thousand years. 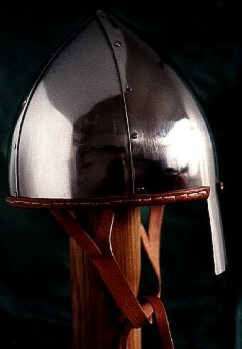 Others are the helm from Sutton Hoo; the Benty Grange helmet; the Morken helm from Belgium; the Jorvik helm; and the Wenceslas helm from Czechoslovakia. These are not a complete list, but they do give an idea of how rare a helmet find is and how diverse the finds are. Metal helms of several types were all fairly similar in principle, being made from bands of metal forming a framework which was 'filled in' by riveting metal, leather (speculative) or even horn panels into it. Sometimes a nasal would be included to protect the face, often as an extension of the framework although it could be added separately. 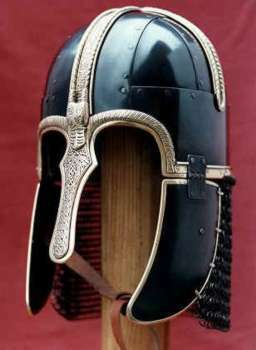 A few of the earlier Anglo-Saxon and Viking helmets had spectacle like eye-guards or visors although these seem to have become obsolete by the eighth century in Britain. Some earlier helmets also had cheek flaps to protect the side of the head and face. The earlier styles of helmet tended to be domed, but gradually they became more pointed to eventually giving rise to the conical helm. The best type of helm was hammered and raised out of a single piece of iron and was therefore stronger than a riveted one. Helmets sometimes had a 'curtain' of mail called an aventail, hanging from the back of them to protect the back of the head and neck. In early times this was sometimes a solid metal neckguard, often hinged for the wearers convenience. Many illustrations from the period of warriors show them wearing what appears to be a phrygian cap; on its own this would not offer much protection so it seems possible that a small domed metal helm or skullcap may have been worn beneath it. Of late though, the view regarding these phrygian hats has altered. They are shown in certain manuscripts that have a direct ancestry to much older works by previous authors. Some were even copies of copies of manuscripts from the Roman period or even earlier, and the slavish copying of the illustrations have little bearing upon 10th century styles. The copyist may have been trying to be true to the original and may also had little clue of what he was drawing. Another element where the Phrygian style could have come from is the old Roman cult of Mithras - where Mithras often can be seen cutting the throat of a bull atop a shrine. This was very much a military man's belief, said to have derived from cults from the East, possibly the Middle East, which had then taken root here in Britain. There is one famous shrine dedicated to Mithras on Hadrian's Wall, and also an example in London. The popularity of this figure, although not its religous aspects could have remained with its associated courageous/heroic deeds, eventually cropping up as 'ancient' Anglo Saxon heroic figures. The original surviving helmets in the true 'Phrygian' style are 4th century BC Greek. Only 1400 years and 1200 miles out. Thick leather was possibly used to make helmets although no leather helms have ever survived from the period. The technique of 'cuir bouilli' or scolding the leather to make it stiff and hard, has been suggested as an alternative for the iron plates inside the frame. Thick leather can be riveted successfully to the frame, however no-one has yet demonstrated that leather can substitute for the iron other than for glancing blows. The 'Benty Grange' helmet from Derbyshire although from an earlier period (approx. late 8th early 9th century AD) had horn plates either side and sandwiching it's iron frame. (Not quite as the replica in the Sheffield museum would suggest). It is also possible that basket work helms covered in hide or leather were used but, again, none have survived from our period (although there is an earlier Scandinavian find of a metal 'basketwork' skullcap which may have been worn over a soft covering). There is even some evidence for wooden helms!! How on earth these worked we can only guess. Mail coifs, or 'healsbeorgs', were worn from the ninth century and tended to cover the top and back of the head, the cheeks, chin, neck and perhaps some of the shoulders. Again coifs are mentioned but have never been found, so we can only guess as to their original shape. By the beginning of the tenth century these had become quite common amongst the professional warriors. 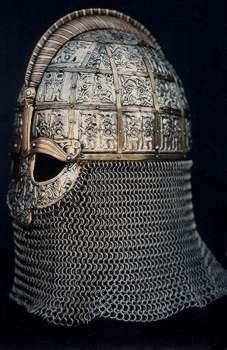 By the eleventh century the coif was often integrated with the hauberk becoming a hood. The 'ventail' section of mail on or near the chest that folds up over the neck and chin, and hooked into position over the lower face, is the best explanation for the shapes found on the knights armour in the Bayeux tapestry. They are not universal, but seem to be a sensible protection for a horseman, as most of the attacks he would receive would come up from below. Padded arming caps would be probably worn under the coif and may also have been worn on their own. The coif as a head covering is shown on figures from Byzantine mosaics, interestingly enough worn by both males and females. How widely elsewhere the wearing of them as normal headgear is unknown until the Middle Ages. Three replica helmets: A replica of a spangenhelm helmet as shown on the carvings on Hylestad church in Norway. 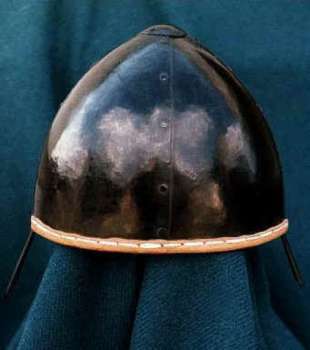 (Note the nose guard and opposing neck guard); A pieced spangehelm in the 'Norman' style that would be worn over a mail hood that was integral with a mail shirt; The Anglian period helmet from Coppergate, York, again using a seperate mail neck curtain. All helmets on this page were made by Ivor Lawton of Dawn of Time Crafts. Last updated 7 June, 2005. Article by Ben Levick 1991, Roland Williamson 1999.